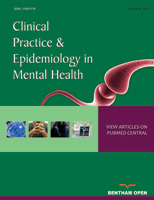 Clinical and epidemiological research in psychiatry and mental health; diagnosis, prognosis and treatment of mental health conditions; and frequencies and determinants of mental health conditions in the community and the populations at risk; research and economic aspects of psychiatry, with special attention given to manuscripts presenting new results and methods in the area; and clinical epidemiologic investigation of pharmaceutical agents. Clinical Practice & Epidemiology in Mental Health, a peer reviewed journal, aims to provide the most complete and reliable source of information on current developments in the field. The emphasis will be on publishing quality articles rapidly and freely available worldwide.